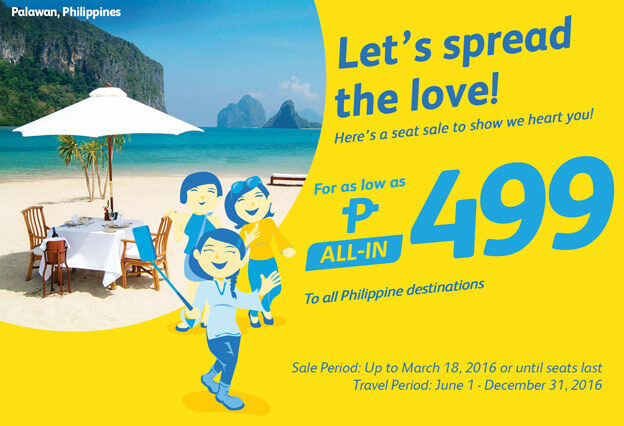 Cebu Pacific Promo Fare 2016: Let's spread the love! Here's a seat sale to show Cebu Pacific heart you! The Piso Fare Promo has ended but here's a new cheap offering that you can avail too. So continue to rejoice with these flight promos. Travel more now! Valid for travel from May 1 to August 31, 2016. DISCLAIMER / Cebu Pacific reserves the right to change, modify and cancel this promotion without prior notice. We will not be held liable for any delay or failure on the part of subscribers to receive seat sale alert notifications for any reason, including an inactive email account, or technical difficulties associated therewith. © Copyright 2013 Cebu Air, Inc.
How can i avail p499 promo for 5 person tavelling manila to palawan? how to book in this adds?? Maglalabas ang promo tapos di naman accessible ung site niyo..anyare??? Lokohan b to? do you have promo flight from manila to tacloban ? date april 15-20.. please. thank you. It's March 24...Anymore promo this time? Magkanu Taipei manila roundtrip July po and travel. Po MAY 18 yung flight rrply po salamat..
How may I avail of the promo P499 from cebu to surigao. Thanks. Hi po this odette,ask ko lng po kung ny promo po kayo from manila to cebu.next yr panaman po. Feb.2 2017 ang balik ko po is Feb.6 pa po.plz inform me kung my promo. good day..meron po ba 499 from manila to cebu? May promo po ba galing Bacolod to Manila ? PISO FARE 2016 is here!!! Summer Sale 2016 Is Here!